Posted June 4th, 2013 - News Posted for ISA News. 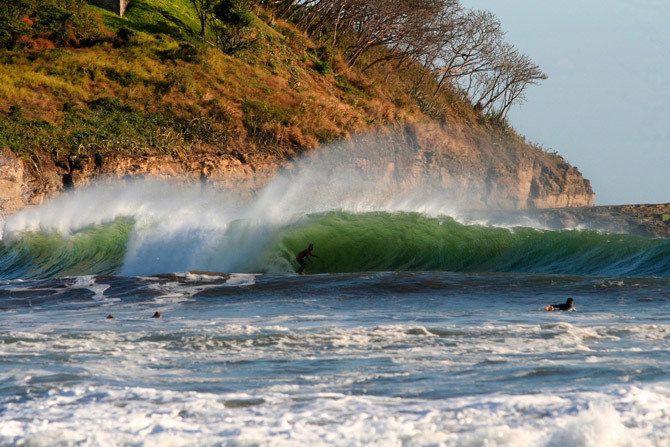 The world’s best Junior (under 18) surfers will enjoy Nicaragua’s incredible waves, which offer big barrel sections, as shown in this photo of the beach break, and long walls for turns and airs. Photo: Jan Glenn/casa-ensueno.com. A total of 30 countries and 300 athletes are confirmed to compete in the 2013 DAKINE ISA World Junior Surfing Championship (WJSC) Presented by Billabong. The world’s largest and most important Junior competition will take place in Playa Jiquiliste in the surf-gifted area of Rancho Santana, located 2 hours from Managua by car. Each National Team consists of up to 4 Under-18 Boys, 2 Under-18 Girls, 4 Under-16 Boys, and 2 Under-16 Girls plus Team Officials. The confirmed countries are Argentina, Australia, Barbados, Brazil, Chile, Costa Rica, Ecuador, El Salvador, France, Germany, Great Britain, Hawaii, Ireland, Italy, Jamaica, Japan, Mexico, New Zealand, Nicaragua, Panama, Peru, Portugal, Puerto Rico, Russia, South Africa, Switzerland, Tahiti, Uruguay, USA and Venezuela. “There are only a few days to go before the Opening Ceremony and the start of the 2013 DAKINE ISA World Junior Surfing Championship Presented by Billabong. All National Teams have been announced and the athletes have begun to arrive in the beautiful country of Nicaragua,” remarked ISA President Fernando Aguerre. Below is a full list of the confirmed teams. Please note team registration closes on Friday and team lists are subject to change. The final list will be found on http://isawjsc.com/teams/ at the close of registration.